One of Damilola Taylor's killers, who was recalled to prison after breaching his bail, has been released. Ricky Preddie was jailed for eight years in 2006 with his brother Danny after being convicted of the 10-year-old's manslaughter in south London. 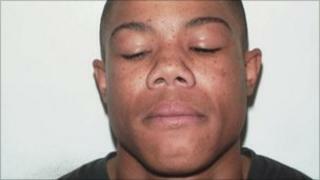 He was released in September 2010 on licence but was returned to Pentonville prison in north London last year. Damilola, 10, was returning home when he was stabbed in the thigh with a broken beer bottle in Peckham in 2000. He was found on a stairwell by workmen who tried to save his life. Ricky Preddie, who was 13 when Damilola died, was returned to jail after being seen in Southwark, south London, and associating with gang members - both against the terms of his release. Danny Preddie was released early in September last year after serving five years of his sentence. Both were convicted in 2005 when forensic evidence, which was missed at the time, revealed tiny blood spots and fibres linking the brothers with Damilola. Gary Trowsdale, managing director of the Damilola Taylor Trust, said: "We hope that this time Ricky Preddie can keep himself out of trouble and the Probation Service can deliver the support he requires to do so. "There is, of course, absolutely zero evidence that he has been reformed and, like his brother, he has never shown remorse. "On this basis, as with every other victims organisation in the country, we do not understand why he was released in the first place. "What can we do, though? The system is the system, and the system is flawed." A Ministry of Justice spokesman said the decision to release recalled offenders was made by the independent parole board. "Serious offenders released on licence are subject to a strict set of conditions and controls," he said. "Examples include a strict curfew and other restrictions on their movements, as well as frequent meetings with their offender manager. If they fail to comply with their licence conditions, they are liable to be returned to custody." The spokesman added that offenders were also monitored by the Multi-Agency Public Protection Arrangements (MAPPA).